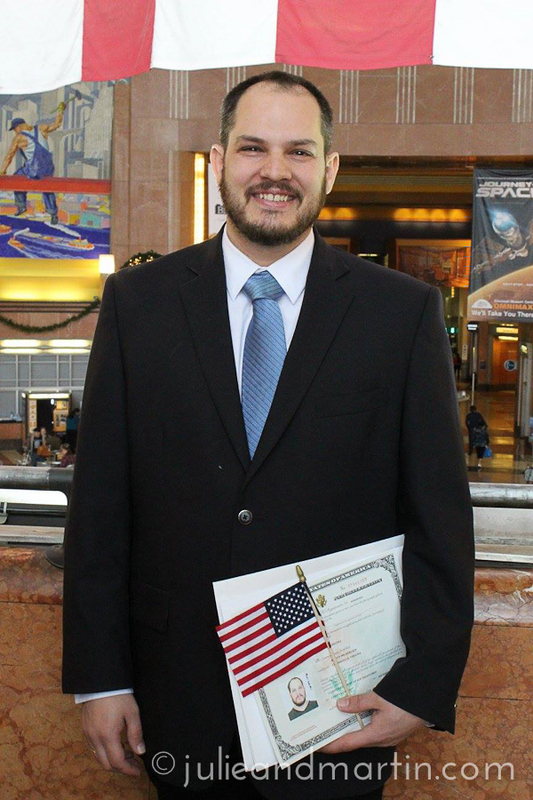 Martin is now an American citizen. 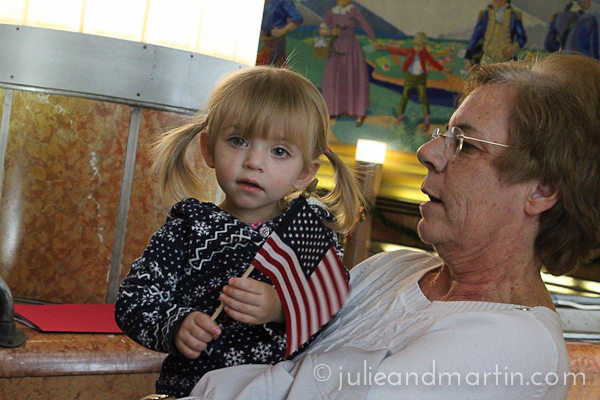 His naturalization ceremony took place yesterday in Cincinnati, Ohio in the beautiful Union Terminal. About a dozen friends and family attended to show support. This happened exactly 16 years, 5 months, 28 days after Martin first met me. 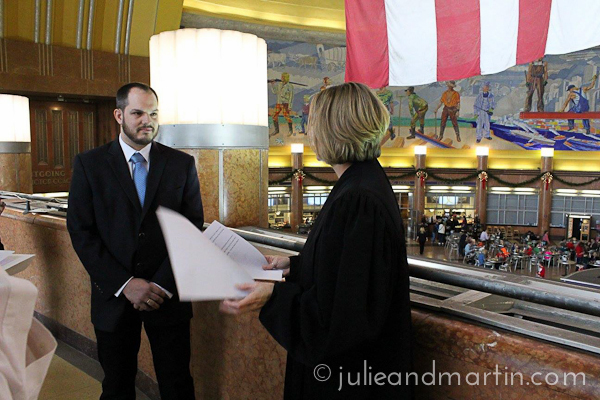 Whereas I was simply born on Texas soil, Martin’s path to citizenship featured lots of twists and turns, and countless delays or pauses that stretched on over the years, spanning three countries. Up until now, Martin was a legal resident of the United States, a designation he first applied for in Italy shortly after we were married almost 14 years ago. It took more than two years for that process to be completed, and that was using the “expedited” process granted to us because I was in the military at the time. A lot of the issues were related to the (then) new Department of Homeland Security measures put in place after the 9/11 attacks. At times, it felt like we were always taking one step forward, three steps back as various agencies introduced new checklists or requirements to us just as soon as we completed something. Nothing was streamlined. Martin with our family in Cincinnati after his ceremony. But finally, he got his green card and we were able to live together as a family in the United States. As a legal resident, he could live and work in the United States, and even join the US military, all of which he did during our decade in Washington DC, as you know. Yet, as a non-citizen, he couldn’t vote in any elections, or serve jury duty, or travel easily and freely outside the country, among other things. None these were really an issue for us, though. My great-aunt holding my niece. 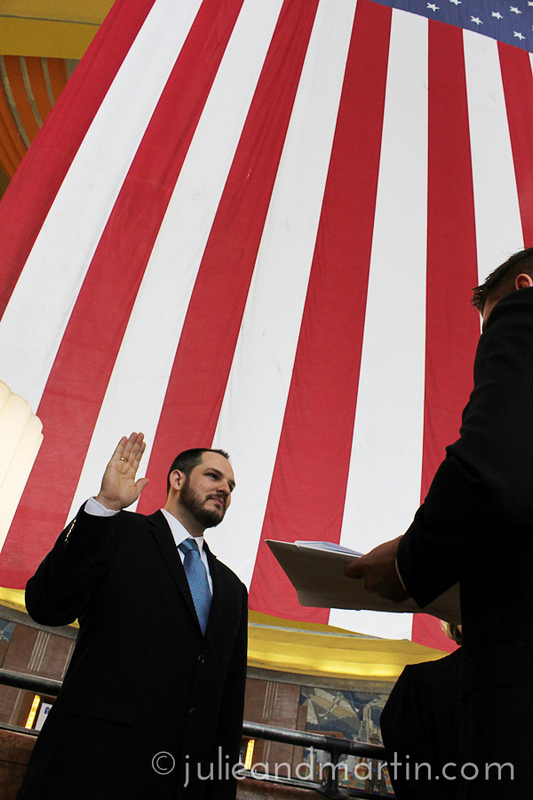 Once we moved to the United States, we could have moved forward with the citizenship process while I was still in the military, or at the five-year point of his legal residency, but we were weary of another long, drawn-out process and the costs involved. Life moved along as normal for us. We just didn’t see a need. It wasn’t until we moved to Germany for my job, though, that we discovered life didn’t exactly move along as normal for us anymore. And with his status on hold, he couldn’t get tuition assistance for his education, which was one of the incentives for him to join the military in the first place. After all those frustrating setbacks, it became clear to us that becoming an American citizen was the only way he could move forward with his plans. 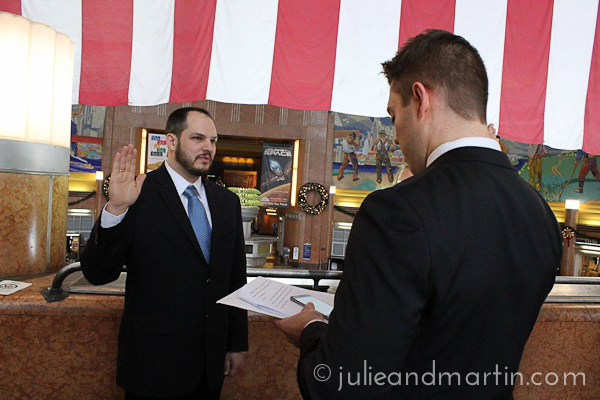 So, shortly after moving here, Martin applied for citizenship. Fortunately, this time around, the process wasn’t nearly as haphazard, and took less than a year to complete. However, after completing his last interview and passing the citizenship test at the consulate’s office in Frankfurt, Germany, he ran into a hiccup: they couldn’t swear him in because neither of us are on active duty military orders. He had to be on American soil. Unfortunately, we had no plans to be in the United States anytime soon. As far as I could tell, this delay was going to put a huge wrinkle in our plans for his career, my career, and the things we want for our family. I needed this to be done ASAP. So, I took matters into my own hands. Then I sent an email to Martin’s contact at the US consulate. She had told Martin that all she needed was some advance notice whenever he got to the United States so she could send all his documentation to the appropriate authorities. I told her the dates Martin was going to be in Ohio, and on a whim, I asked if she thought the folks in Cincinnati would be open to having the ceremony in Union Terminal. You see, I’ve written about Union Terminal before. It’s a gorgeous Art Deco train station that, in my opinion, is probably the most American building in the city, if such a thing existed. There’s a giant flag hanging in the rotunda, and a colorful stone mural — designed by German-born American Winold Reiss — which depicts how settlers and immigrants arrived and built the city. It’s where my grandfather and great uncle, and countless men and women, departed for and returned from World War II. Not to mention, my family visited the museum there often when I was a kid, it was the site of my first job as a teenager, it’s where I took Martin the first time he ever visited me, and my dad continues to volunteer there now. I couldn’t think of a better place for his ceremony. So, once I sent that email, I wrote a note to my Dad asking if he would host his son-in-law for a visit. Of course, I knew the answer. And I didn’t tell Martin a single thing about any of it. My plan was to literally drive up to the airport the morning of his flight, hand over his suitcase, and kick him out of the car with the plane ticket in his hand. In the end, I told him shortly before we left for Austria for the Thanksgiving weekend. I realized I needed him to connect with the German preschool to square things away for Jaz. So, by the morning of his departure, he knew everything. Once he arrived in Cincinnati, my father promptly took him out for cheese coneys, and handed over a list of home repairs left unattended ever since our move to Germany. In the days leading up to the ceremony, Martin spent the time sleeping in, visiting family, going shopping, and completing those home repairs for Dad. 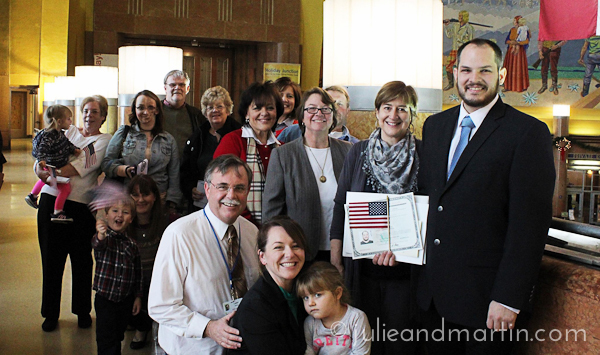 As it turned out, the United States Citizenship and Immigration Services-Cincinnati office and the officials at Union Terminal were more than happy to conduct a special ceremony for him. 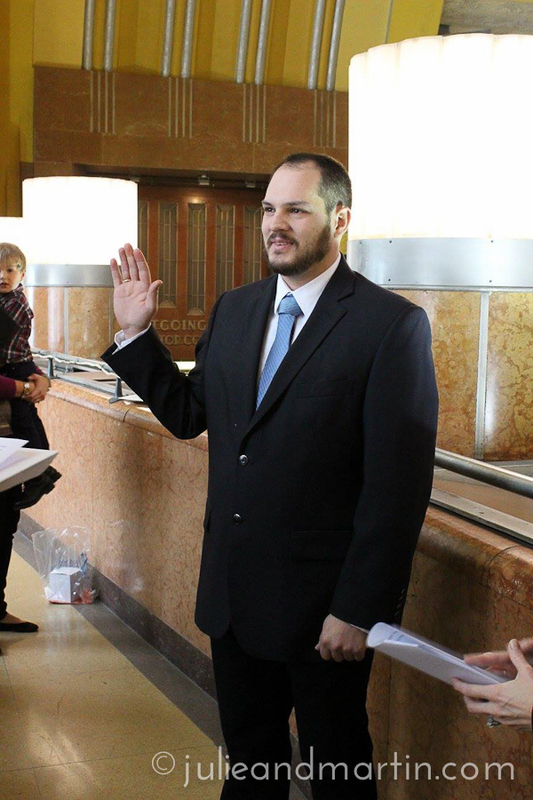 To the best of their knowledge, this was the first time anyone became a citizen in that building, and both parties expressed interest to hold ceremonies there in the future. 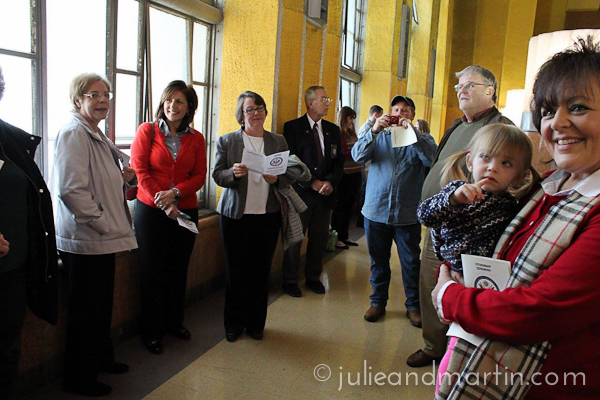 So, on the day of the event, our friends and family gathered around Martin and the officials underneath the American flag on the catwalk overlooking the mural and rotunda, which is already decorated for Christmas. Martin said he was a bit surprised by the turnout. My mother Tawana and her boyfriend Trev drove all the way from Oklahoma to surprise him. Our friend Carla, who attended our wedding in Germany almost 14 years ago, was there, as well as our friend Nicole, who served with me in Italy. Howard, who wrote an article about us for Valentine’s Day in 2002, also came to show his support. Of course, Dad, Linda, Aunt Sue, Aunt Janet, and our cousin Paula, my sisters Jinger, Jill and her two girls, were all there to watch Martin take his oath. And thanks to modern technology, the kids and I were able to watch the whole thing live via the Internet. Throughout the event, Dad held up his cell phone so we could watch via the Periscope app. Everything worked so seemlessly, we didn’t even notice when he handed over the phone to another person before running off to cue up the National Anthem on the rotunda’s organ right after everyone said the Pledge of Allegiance. It was such a great moment. Even from afar, the kids and I could sense all the excitement and buzz in that place. When Martin and I were able to chat afterwards, he admitted he was really glad the ceremony took place there with friends and family. He was definitely right about that: a lot of people wanted it to be a special event for him, and we’re grateful to all of them. This includes all the government officials from various agencies who worked together quickly to permit this ceremony at Union Terminal for him, as well as those here in Germany who helped me and the kids when I promptly came down with viral pharyngitis two days after Martin left. These were our American friends and neighbors who walked the kids home from the bus stop so I wouldn’t have to get out of bed, dropped them off at their music lessons, and made sure we had milk in the house. I don’t have any regrets planning this trip for Martin, and keeping it a secret from him for as long as I did. He knew when he married me that I’m bullheaded and full of surprises. I’m excited for all the opportunities ahead of him now, but mostly, I’m really looking forward to him coming back home, which is to me and the kids. Plus, it’s been awhile since I’ve kissed an American.